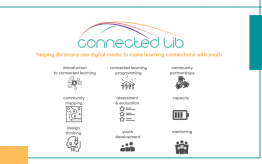 As the Digital Media and Learning Conference panel discussions and featured talks are being finalized and keynote addresses are getting polished, here’s a glimpse of the 10 pre-conference workshops being offered this year. Taking place Oct. 4, the day before the two-day main conference at the University of California, Irvine, the workshops offer deep dives into hands-on activities, mini-courses and working sessions with top experts in the digital media and connected learning field. Topics range from courses in media making, learning analytics, program evaluation and game design to tackling problems in research and practice. “Games for Impact in the Trump Era: What Do We have to Contribute?” — Led by UCI’s Constance Steinkuehler and Kurt Squire, this three-hour workshop will explore the contributions games for impact could or should make to the pressing social and political issues of the President Donald Trump era. “Power Brokers II: Critical Perspectives and New Approaches to Supporting Pathway Building Among Non-dominant Youth” — Led by Angela Calabrese Barton, of Michigan State University, and Dixie Ching, of New York University, this six-hour workshop will challenge and expand traditional notions of brokering and examine the role of power in brokering dynamics, forms and outcomes. “From Good Intentions to Real Outcomes: Equity by Design in Learning Technologies” — Led by MIT’s Justin Reich and UCI’s Mimi Ito, this six-hour workshop will build an ongoing series of working meetings that Reich and Ito have been facilitating in order to synthesize the learnings from research, design and practice in ways that are useful and actionable to change makers, funders and tech innovators. “Learning Analytics in Informal Spaces” — Led by Caitlin K. Martin, of Digital Youth Network and Charles Lang, of Columbia University Teachers College, this three-hour workshop will focus on learning analytics in informal environments with an online component. “Why Making is Important to Assessment and Why Assessment is Important to Making”— Led by Maker Ed’s Jessica Parker and Stephanie Chang, this six-hour workshop will bring together researchers, educators and designers interested in negotiating the potential opportunities, challenges and needs related to making and assessment within a K-12 context. “Connecting Youth Interests to Success: Frameworks and Strategies for Informal Educators” — Led by Crystle Martin, of the DML Research Hub and Linda Braun, of LEO: Librarians & Educators Online, this three-hour workshop will consider how informal educators, such as librarians, can help youth make connections between their interests, academics and future opportunities. “Staking Your Claim: How the Open Web is Won for Teaching and Learning” — Led by Chico State’s Kim Jaxon and technologist Alan Levine, this six-hour workshop will highlight inspiring examples of open online courses. 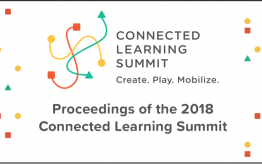 “Designing Learning Games: an XCD Approach” — Led by MIT’s Eric Klopfer and Scot Osterweil, this three-hour workshop will feature a learning game design approach and practice to create powerful and engaging learning game experiences. “Preparing Teachers for the Connected Learning Ecology Through Playful Practice Spaces” — Led by Torrey Trust, of the University of Massachusetts, Amherst, and Dan Roy, of MIT, this six-hour workshop will focus on how educators can focus on preparing future teachers to support students’ interest-driven and academically oriented learning in the digitally rich connected learning ecology. “Designing Connected Research for Equity and Justice” — Led by Nicole Mirra, of Rutgers University, and Bill Penuel, of the University of Colorado, Boulder, this six-hour workshop will offer strategies for developing more inclusive research approaches with youth, teachers, district administrators and other local stakeholders in today’s learning ecology. 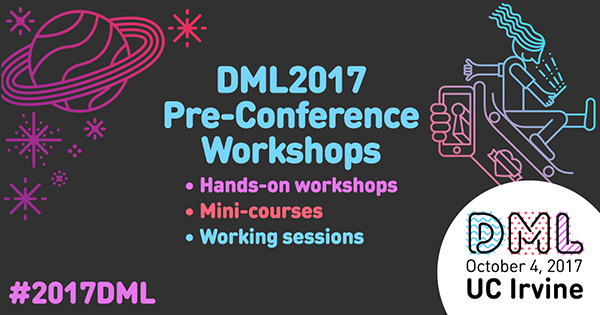 Stay tuned for more details on the 2017 DML Conference, and its provocative keynotes and Ignite talks.